Mekov is a professional company of common home used screws, nylon ties and common home tools. Our goal is provide high quality of convenience tools and parts for your home. Mekov - Prefect tools for your home DIY. Tips:Not suitable for children under 5 years old due to small parts, prevent inadvertent swallowed. 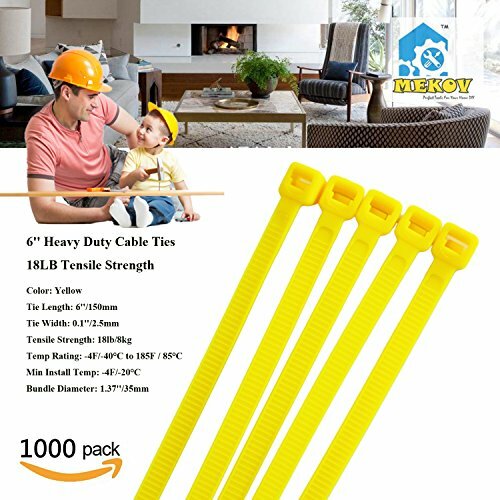 HEAVY DUTY - 6 Inch Heavy Duty Nylon Cable Ties Nylon Cable Ties, 18-LB Tensile Strength, Zip Ties with 0.1 Inch Widths provide high levels of tensile strength to tie. EASY TO USE - Tapered ends for easy application. Locks tight without stretching or slipping. HIGH QUALITY MATERIAL - Durable and flexible PA66 nylon material with temperature range -40F to 185F, great for Indoor & Outdoor use, UV Resistant. WIDELY APPLICATIONS - Ideal tools to solve disorderly phone/computer/TV cables, tight and fix small parts at home, office, school, garden and workshop. If you have any questions about this product by Mekov, contact us by completing and submitting the form below. If you are looking for a specif part number, please include it with your message.